History :: The Union exists to promote golf in the County and to provide competition for the top county players as a route to Midland and International golf. By 1922 Staffordshire was the only Midland County without a County Union yet its members were winners and runners up of the Midland Counties Championship 1919-1922. This led to a desire for a County Union to promote a County Championship and County Matches, a uniform method of handicapping and assisting the game of golf in the County. To this end a meeting was convened at the Grand Hotel, Birmingham, on May 3rd, 1923. Eight clubs were present: Oxley Park, South Staffordshire, Sandwell Park, Walsall, Dartmouth, Handsworth, Penn, and Little Aston. Thirteen clubs first joined the Union whilst 13 more hoped to join when they were out of debt. 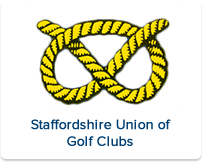 The effort to promote excellence in golf went hand in hand with matches against other counties and in 1953 it was proposed that badges displaying the Stafford Knot should be presented to players who scored a minimum of 15 wins in the 1st Team, backdated to 1948. That meant that 8 players were awarded County Colours. The Union is indebted to Brocton Hall G.C. for allowing it to use it's Clubhouse as the Union's Headquarters.